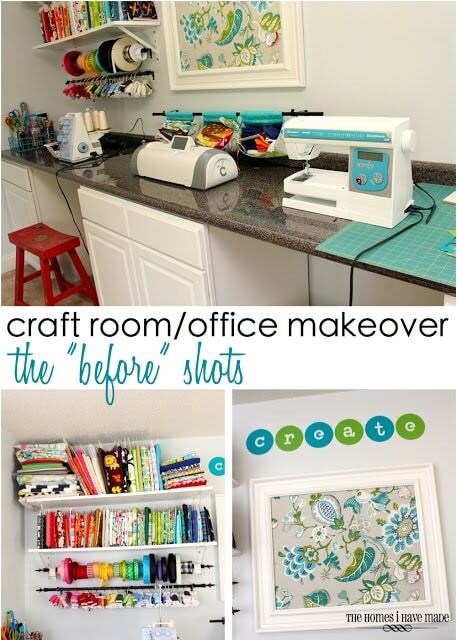 My Summer Project – a Craft Room/Office Makeover! Hey Everyone! I hope you’re all having a great week so far. Thanks so much to all of the blog love about my “One Year Later” post from Monday. It was a fun one to write, and so gratifying to look back and see what all we’ve done with our little empty house in the course of a year. As I mentioned on Monday, the Craft Room/Office had gotten off to a great start with the addition of a craft counter (made from a stock counter and kitchen cabinets) and a few little projects; but it had otherwise gone un-touched and neglected since the first few weeks after we moved in. Not neglected in the “we never use this room” sense; quite the opposite. 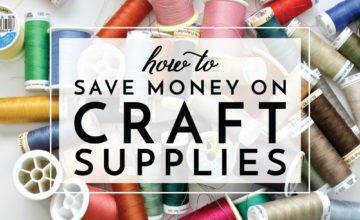 This room, between all the craft supplies and the computer, is probably the most utilized room in the house. However, it became a dumping ground for pretty much everything else that didn’t have a home. 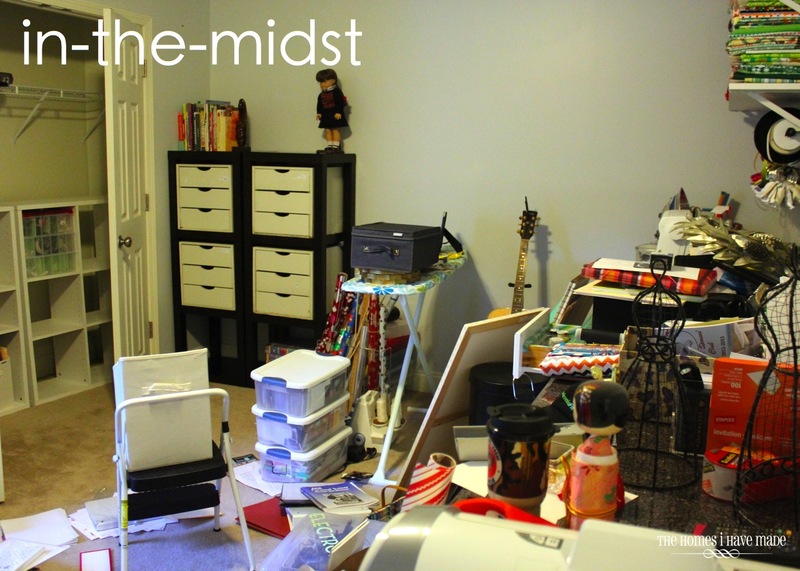 The décor was never finished, and we never found a way to organize the desk that worked for both Greg and I–it constantly became a black hole for office supplies, cords, and papers. What was supposed to be my “creative happy place,” became a place I could never keep clean and could never work in efficiently and was never inspired by. In essence, I didn’t really enjoy being in there. This desk was a new purchase in our last home. We bought it before we really honed in on what we like and don’t like in furniture, and before we started shopping consignment and thrift stores. We spent way too much money on this desk and unfortunately, it has NEVER worked for us. At this point we can’t sell it for near what we paid for it, so one of my big challenges was to make it work. Stay tuned to see my solution! See what I mean about a dumping ground? Any wreath, mirror, frame, plaque, or other random odd or end always ended up here. I couldn’t stand the clutter any longer. 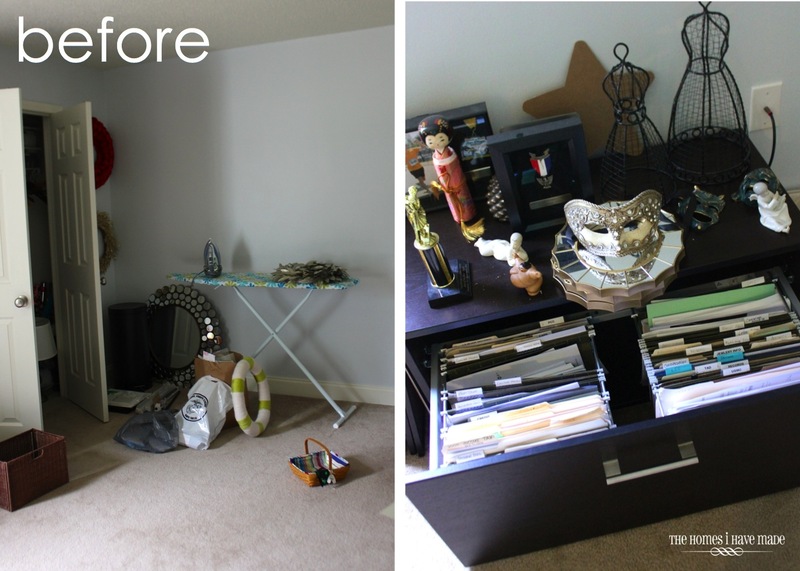 It was time for this room to match the rest of our well-decorated, heavily DIYed house! As most of you know (if not, then read my about me page ;), my husband is in the military. As can be the way sometimes, he somewhat unexpectedly deployed a few months ago, leaving Henry and I to spend our summer on our own. (FYI – He’s in a safe place and we hear from him often, we just miss him to pieces and are ready for him to come home!!) One of the best ways for me to cope and survive when my husband is gone is to have a long-term project I can throw myself into and work on during the lonely nights after the little guy is in bed. 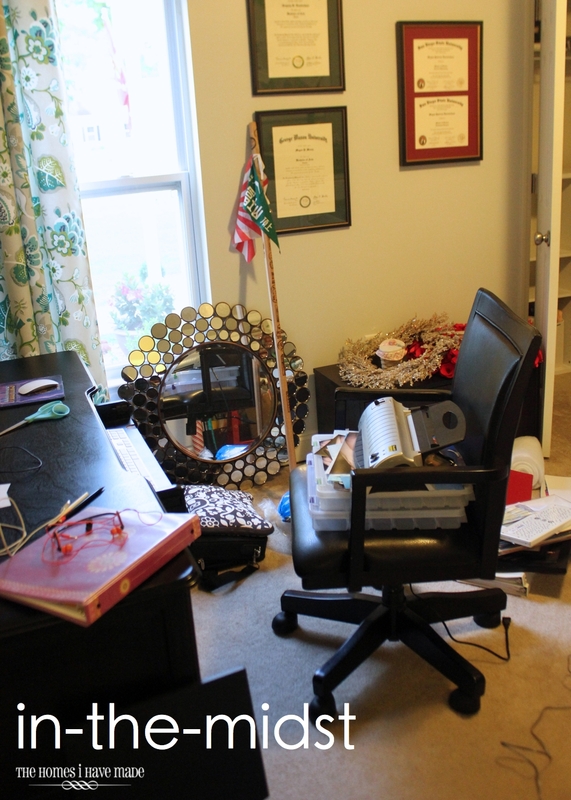 Well…the office was the obvious project for just that…and throw myself into it I did! Every bin, basket, drawer, closet and shelf was emptied or taken down. 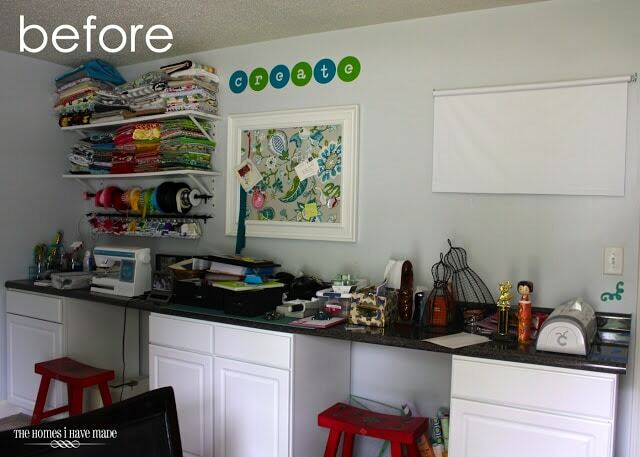 I sorted, purged, re-organized, and brainstormed how best to use this space and what all needed to be done to make it work efficiently as a Craft Room and Office. I have been really, really hard at work in this space. It’s still evolving and some things aren’t quite done, but some major DIY projects are, and I can’t wait to start showing you! I know posts full of “before” pictures are not that exciting; but I really like to start with all the ugly shots and then walk you through everything step by step as I go. To “wet your whistle” so to speak, here are some fun things coming up! On Monday, I will show you one of my first projects for this space! Until then, I hope you have a great weekend!! Lamp Makeover: A Touch of Gold! One thing, that you have in your favor, is that you can close the door and escape to you lovely tranquil bedroom. I'm looking forward to seeing how you reorganize everything. I'm in the middle of doing this with my stuff and I often get stumped. I can't wait to see what you do with it!!! 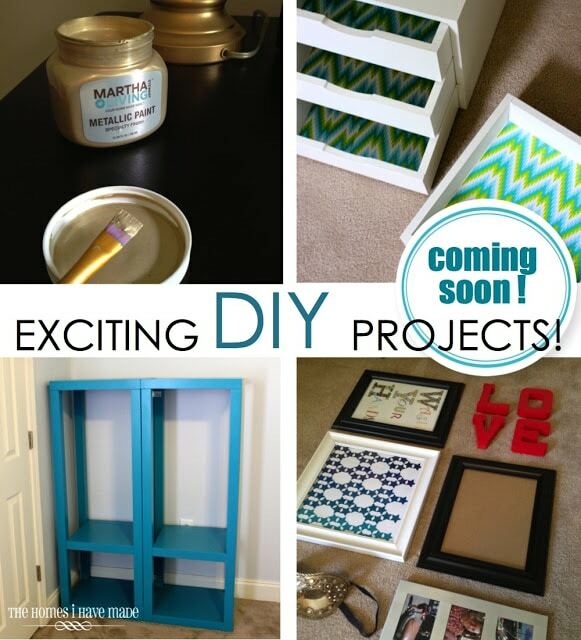 I love the pattern and colors in the little drawers that you gave a sneak peek of! 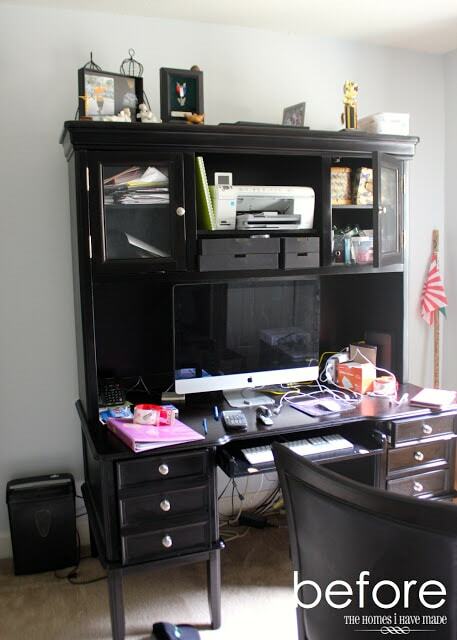 Now that's a lot of stuff there in your home office. 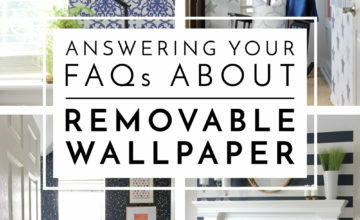 We're so curious how you can de-clutter and organise those. Looking forward to your update!